TweetSwitch is a free service that allows you to tweet and receive your tweets from any instant messenger or via email. TweetSwitch is a web service so you do not need to install any new applications. You simply log-in to TweetSwitch using your Twitter account, and configure the way you want to send and receive your messages. 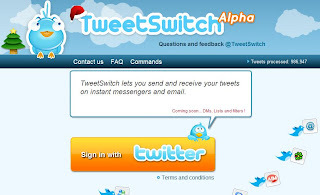 TweetSwitch currently supports AIM, Windows Live Messenger, Yahoo! Messenger, Skype and Google Talk. In addition TweetSwitch supports all email providers.